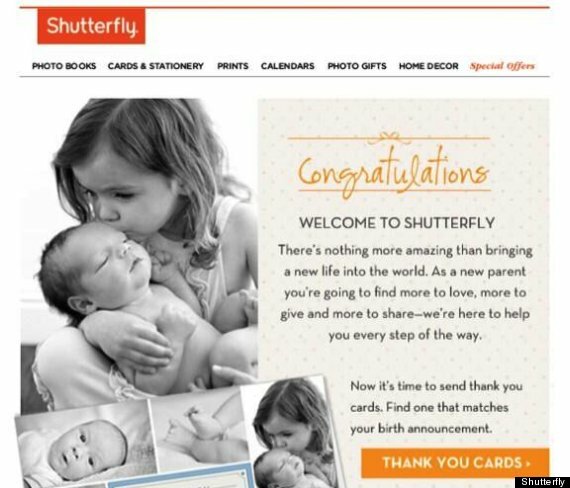 In a targeted email campaign gone terribly wrong, the photo-printing website Shutterfly mass-emailed an unknown number of people on Wednesday to congratulate them on their newborn babies. What's wrong with the email? Many of those who received it did not just give birth. "There's nothing more amazing than bringing a new life into the world," the email begins, going on to encourage the "new mothers" (many of whom, again, are not new mothers) to find the right "birth announcement" on Shutterfly. Shutterfly's main business is taking your digital pictures and painting them in photo books, cards, calendars and so on. "Earlier this morning, we unintentionally sent an e-mail to some of our customers." A spokesperson for Shutterfly told The Huffington Post. "We deeply apologize for this intrusion and any offense this may have caused. Our intention was to email customers who have recently purchased birth announcements with us, and it was sent to a larger distribution in error. Naturally, Twitter was chuck-full of upset Shutterfly users who simply can't remember ever having a baby. Shutterfly sends email congratulating me on new baby. I have no recollection of this event. I hope I didn't leave a baby at the hospital. Just found out I'm a Dad via a @Shutterfly email campaign. This...is news to me. Also: I have a Shutterfly account? DELETE. UPDATE: Shutterfly's comments to The Huffington Post have been updated within this post to reflect an updated press statement.